Fires are particularly dangerous disasters that can happen with almost no warning, cause different types of extensive damage, and significantly threaten the health and safety of those in the building. Putting out the fire will stop the immediate damage caused by the flames but there are soot, corrosive byproducts, and chemical emissions left behind that can spread to cause permanent damage after the fire is out. 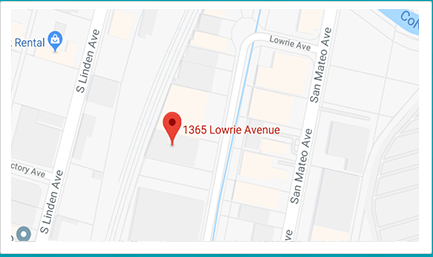 ServiceMaster Disaster Restoration and Recovery provides fire damage cleanup services in San Carlos, CA to repair and restore fire damaged homes and businesses. Our fast response will help limit the damage and we provide full restoration services to restore all types of damage. 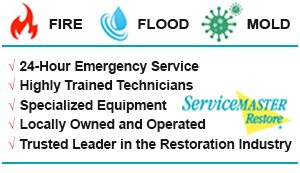 The licensed and insured technicians of ServiceMaster DRR are properly trained to provide full fire damage restoration services for large and small fire losses in commercial and residential settings. We arrive on the scene within 1-2 hours of your call with the best cleaning products and equipment of the industry to limit the spread of the damage and prevent it from becoming permanent. We can also effectively salvage a variety of at-risk household surfaces from soot damage such as porcelain, brass, chrome, stainless steel, carpet, and upholstery with potent chemical cleaners. Brush off carpet, upholstery, and drapes to remove loose soot. Use old towels or linens to cover the carpet in high traffic areas. Throw away open food packages because the food is most likely contaminated. Clean the inside of your refrigerator thoroughly if you lose power. Submit your smoke damaged clothing to a professional for restoration dry cleaning. Wipe Formica, porcelain, and chrome surfaces to help prevent tarnishing and etching. Wipe soot from the leaves of your houseplants. Use damp cheesecloths to filter loose soot from the air by taping them over the supply and return registers. If the outside temperature is above 60 degrees, open your doors and windows to air out the home and reduce smoke odor. Cleaning soot damaged walls improperly can make the damage worse so leave this to our technicians. Do not attempt to clean soot damaged carpeting and upholstery. Avoid using electrical appliances that might have been damaged by the fire until they have been inspected. Do not use ceiling fixtures on a wet ceiling. Do not touch soot damaged surfaces because the oils in your hand can penetrate woodwork, upholstery, and drywall to make it worse. Do not eat food that is possibly contaminated. 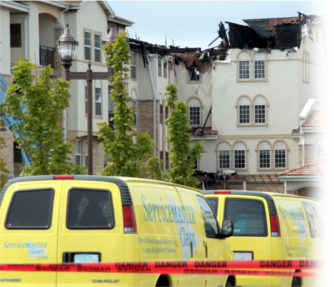 Contact ServiceMaster Disaster Restoration and Recovery immediately for fire damage restoration. Putting out the fire is not enough to stop the spread of the damage, soot and other corrosive byproducts can still spread to cause permanent damage in the aftermath. Once the fire has been extinguished in your home or building in San Carlos, CA, contact ServiceMaster Disaster Restoration and Recovery for fire damage restoration services. We are available 24 hours a day at (800) 439-8833 for fire damage emergencies in San Carlos, CA. “A client/friend’s house caught fire the other day and every time this happens, it is always a very traumatic experience. The devastation on their faces and their be-wilderness is a very common reaction. The feeling of loss and being lost is understandable, so it is during these occasions where I have to be there for them. The first thing I did was to calm them down and called Servicemaster. They do mostly restoration and clean up after a fire/flood/water damage etc. They are not general contractors. They only clean up, restore, and house your personal belongings at their storage facility. They will store it there until the house is back to live able condition. Best of all……….the insurance company will pay for it.